Igniter is for designing vehicle and engine sound effects with ease and is available as a VST/AU/AAX plugin. It changes the way you design vehicles in your DAW, making them easy to perform, automate and edit. 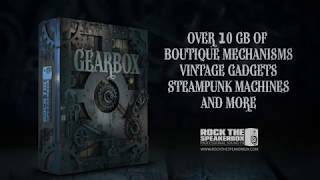 It also includes a huge range of vehicles and presets straight out of the box, including a library of up to 75GB of recordings from top sound recordists and designers. What goes into creating a tool like Igniter? What features are you most proud of? Igniter was an extremely large and challenging project! You can see that the plugin includes an enormous range of features and is also a very powerful sound design tool beyond vehicle design. We’re proud of all of it! We went through a lot of prototypes and worked closely with various people in the industry to get an idea of how professionals would want this kind of tool to work, and what they felt were the key features it needed to include. We were very pleased to see how the granular engine can handle a huge range of vehicles, from everyday car sounds, to motorbike engine sounds, cold-war rattly sedans and even 18-wheeler-style haulage trucks (all of which are included in the plugin), and our one-shot and loop systems are very powerful in of themselves as sound design tools. I think we managed to make a very complex workflow manageable from a single plugin-in UI, plus making it very satisfying and quick to work with. The drag and drop functionality of any of the hundreds of parameters in the plugin within the modulation system, and then custom curves and parameter ranges combined with those modulators still blows my mind and excites me as a creative person. From a technical perspective, can you share some details on how Igniter works? I can only say so much without giving away the secret sauce! Igniter is a collection of processes which are typically used in vehicle design all brought into one system, controlled from a single master control. Our granular system uses a special tool to analyse and prepare vehicle recordings before exporting them, ready for use in the plugin. We do this for all types of recording, engine, exhaust, onload and offload and we have a few tricks up our sleeves which make this tool able to handle very large ranges of content and recording types. After these are prepped, we include them with the plugin, ready for users to use quickly and easily. This helps avoid the complex and technical side of preparing the material for the user, and keeps the UX simple for users who might not be extremely knowledgeable about the technical side of vehicles. Like all Krotos products, we want to get sound designers working as quickly and as flexibly as possible. Other systems in Igniter share some DNA with concepts from game audio, but with our own spin. We’ve been excited to hear the responses from users in post-production, who’ve found this new workflow extremely powerful and creative. How does the user go about performing vehicle sounds? Can you give some real-life examples of how it’d work in a project? It’s very easy to perform a vehicle in Igniter. Simply load a preset and control using the master Revs controller. 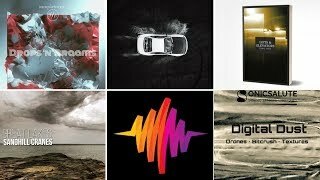 Our sound designer Andrew was able to put this video together, including a large number of tweaks, edits and adjustments, in a few hours using Igniter’s factory presets. This was a great moment for us as a team as it really showed how fast and flexible this new workflow was. I can’t imagine how long it would have taken to source, sync, edit and process sections of various recordings from any number of libraries for all these vehicles, let alone then respond to changes in the edit or the feel of the mix. Using Igniter, we could simply draw in automation to match the footage or perform directly to screen using a midi controller, including the processing, reverb and doppler required per shot. 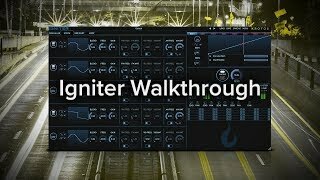 Because Igniter is ‘driven’ (pun intended) using a single master controller (which in turn can be controlling the relationship between hundreds of parameters) it’s easy to perform and control your work to this footage, without having to set up and adjust huge numbers of automation lanes in your DAW. 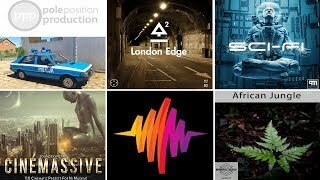 The plugin also includes a massive range of vehicle and engine sound effects, from sports cars, trucks, bikes, helicopters and also sci-fi presets, so the entire video could all be done seamlessly. What’s the difference between the two versions of Igniter? 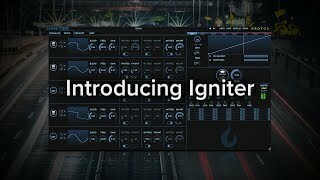 Igniter includes the full plugin, with 24 performable vehicle and engine sound effects, 200+ presets and a 6GB library of edited assets, ready to use in the plugin through the file browser. Igniter Full Tank includes everything listed above, including a massive 75GB of raw, unedited, multi-channel assets, which we used to create the factory library. This gives you an enormous resource at your fingertips, and the best of both worlds; a huge library of vehicles for a traditional workflow, and Igniter to perform these vehicles. That way you can combine the two workflows and libraries to maximum effect, and go beyond Igniter’s factory library if your projects demand this. You can of course use your own assets in the one-shot and loops systems as well. How does Igniter transition between various driving styles, skids, slides and similar? What’s some of the behind-the-scenes work you are doing to make those transitions seamless? Most of this is handled by how you can setup your presets, or how you perform or automate the vehicle. We also have various presets which demonstrate how this can be setup. You can use both one-shot, loop and modulation systems to set up skids, slides and any attenuation, boost or effects you might need at a specific point. Our default preset in the plugin also shows how you can integrate skids and slides easily. Does Igniter offer any game engine or middleware integration? Yes, we are working on this. The middleware version is still in development, and we’re open to getting feedback from developers to make the best possible system. We have been demoing this at GDC this year. Any tips for making the most of Igniter? I would advise users to spend some time with, and full explore the plugin, as there is a lot of ways in which it can be used. I’m still coming across ways to use it! I’d recommend making maximum use of the modulation system, which is really the key to making dynamic, performable designs. Adding effects from the effects rack into these systems can also help add extra dynamics or shape to a design at different points in the RPM range, which is also very easy to do. Also don’t forget that Igniter can also be used for many purposes outside of vehicle design. Try building dynamic crowd systems using the loop system, or using the one-shot system to perform hulking robots or Foley sounds.